Planning on participating in a runDisney event? Before you go, download this helpful Essential runDisney Packing List so you are prepared. Hey there friends! I’m Gina, the other half of “Sweet Disney Delights” and owner of “From Gina’s Kitchen”, a small baking business located in the Manassas/Haymarket area of Northern Virginia. My BFF Melissa has so graciously asked me to guest blog today about runDisney and how to pack for a race weekend. 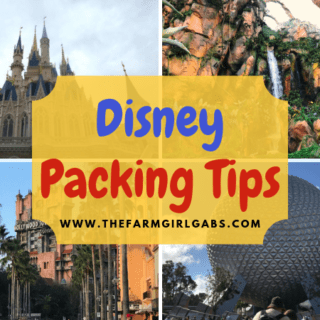 Be sure to check out the Disney Packing Lists resource page here on the blog for more helpful Disney packing tips. RunDisney hosts races several times a year and, in several locations. In addition to the four race weekends offered in Orlando, FL at Walt Disney World, you can participate in runDisney races at Disneyland in Anaheim, CA and in Disneyland Paris! I’ve been run/walking 5k races around my hometown for years. This summer I ran a 10k at the local Manassas, VA airport, Now, I am preparing to run the Disney Princess 10k in 2020. 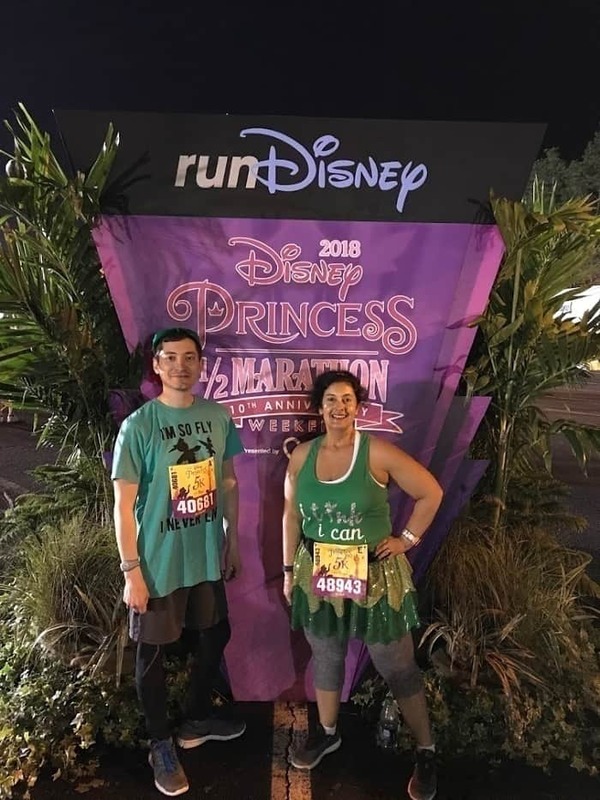 I ran my first runDisney race this past February, with my brother. We agreed to start with the Princess 5k and our experience did not disappoint! Melissa was there to chEAR us on, and I’m happy to say we are doing the Princess 5k again in 2019! Eventually I’ll get to the 10k, but for now, I’m so excited to start planning and preparing for those 3.1 magical miles in February around Epcot. The most exciting thing you’ll pack? Your running costume, of course! My brother and I ran as Peter Pan and Tinkerbelle in February. He made his own costume , but I bought mine from a cute little Etsy shop called “The Pretty Pumpkin”. If you aren’t creative and need a little help, visit her Etsy Shop. I’ll be shopping with her again soon as I plan to run as Jessie to my brother’s Woody ! So what do you have to pack for a runDisney race? Melissa asked me to create this packing list to help first-timers (and to remind seasoned runDisney participants) of items that are helpful to have with you during a race weekend. Although you can visit the runDisney Expo while you are there and pick up some of the items on my list, which I did in February, I like to spend my time in the parks and not in long lines shopping at the expo. Trust me, I can write a whole other blog post on that subject! Let me just say, pack your patience if you visit the Expo. Click here to fill out the form to download your FREE runDisney Packing List! Like Melissa, I’m a list girl. I love my planner, my calendar and my notepads and post-it notes . I never use the “notepad” on my iPhone, although I’ll occasionally text myself a reminder to do something. We have “Alexa” but don’t utilize her shopping list feature the way most folks do. Just give me a good old-fashioned notebook and pen and I’m a happy girl. Or, even better… a PRINTABLE LIST that I can take with me. I hope you find my list of runDisney packing “must haves” helpful. Do you need everything on my list? Probably not. But at least pack patience, confidence, and a BFF to share the experience with! Oh and don’t forget a pair of good running shoes. Because you know, a good pair of shoes can change a girl’s life!